Stories are mysterious things–they transport us to faraway lands, make us experience emotions we didn’t know we could, remind us of all the best and the worst in life. They cause us to cry, laugh, smile, reminisce and contemplate. We become involved in the lives of the characters, associating ourselves with some while distancing ourselves from others. And although stories are often presented in the form of a book, a podcast or some other verbal method, they certainly don’t have to be. In fact, they can be told through something completely different, such as a fragrance. When Tonya Kidd-Beggs was sitting in a village in the French Riviera smelling small bottles of scents perfumers use to make fragrances, she began to remember some of her most difficult memories. The aromas influenced her thoughts and feelings, just as a great novel would. The memories she recalled became the inspiration for the first of two fragrances from STORIES by Eliza Grace, the brand she founded. Fragrance No. 1 opens with the scents of bergamot, grapefruit and orange blossom, followed by cedarwood, jasmine, heliotrope and a fig-tea accord. Amber, sandalwood and a bit of vetiver add mystery to the fragrance, which is contemporary, refined and enticing. Fragrance No. 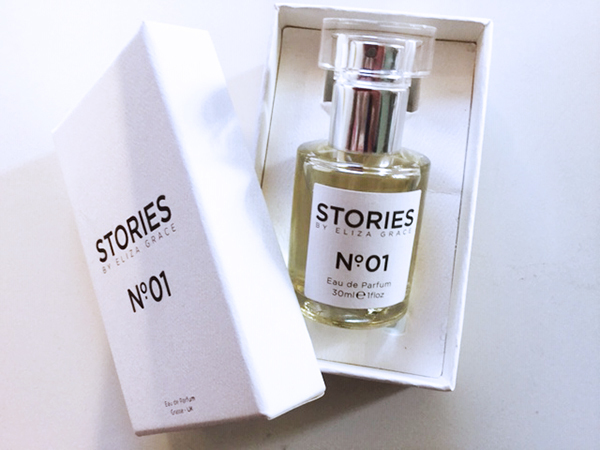 2 starts with notes of bergamot and Bulgarian rose spiced with ginger, cardamom and green tea. The heart is honey tobacco and cedarwood, and the scent is finished with opoponax, tonka bean, patchouli, amber and musk. The scents are available in 2 ml, 15 ml, 30 ml and 100 ml eau de parfum options. The line also includes body wash and body lotions in the same fragrances. As a novel is to an author, so the fragrance is to the perfumer. Kidd-Beggs created the fragrances to tell her own story, a tale with which the wearer can relate. Personal engagement is important to the founder, whose brand is named after her own twin daughters, and the products are meant to inspire the aroma of memories. STORIES by Eliza Grace is an environmentally conscious brand, creating its boxes to be repurposed and considering the planet in each stage of the design process. The products are gender-inclusive and made to be sold at high-end retailers. In the future, the company will expand its line of fragrances and develop goods for the home and the wardrobe.